Snaidero Middle East welcomes a new Italian into the family. Snaidero. Wery. Move. And now Novello. Novello bathroom vanities are the latest addition to Snaidero Middle East’s selection of distinguished kitchen, wardrobe and walk-in closet brands. Novello collections can be seen online or in person at showrooms in Lebanon. Novello began as a carpentry workshop in 1956 and, over the decades, focused on product development. By introducing new materials for bathroom furniture – the latest, crystal - and improving design and functionality, the company’s collections suit bathrooms of any size or desired style. Snaidero Middle East offers Novello’s prestigious Superellisse collection designed by the well-known Marco Piva, as well as Klass, Green, Kiss, and Trend collections. 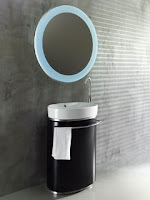 Novello re-launched the last three as part of its 50-year anniversary celebration at Milano Salone del Bagno 2006. Interested parties - architects, home and project owners , and dealers - may contact Snaidero Middle East online about Novello bathroom vanities and other brands. Novello bathroom vanities are also on display at Snaidero Middle East’s Zouk Mosbeh and Homeline Jnah showrooms in Lebanon. New showrooms will open shortly at Homeline Zalka and Homeline Jounieh. Snaidero Middle East, established in 1996, has developed a solid distribution network throughout the Middle East, with headquarters and manufacturing facilities in Lebanon and 12 showrooms in Bahrain, Cyprus, Kuwait, Lebanon, Qatar, Saudi Arabia, Syria, and the United Arab Emirates (UAE).